Q: What kind of info do I have to provide? A: Just the basics. Name, email, phone number, and return address. 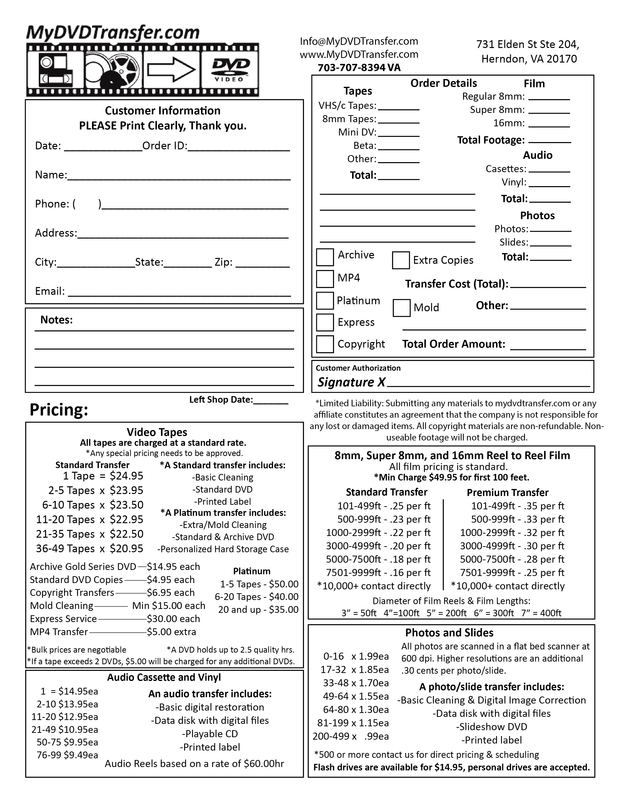 Our order form, found HERE, has the relevant sections for you to fill out. Q: Where do I send my tapes? A: Please contact us to get our current shipping address. Q: Can you clean moldy tapes? A: Two weeks on average. It really depends on the size of your order and the time of the year. Since we are a very small business that focuses on quality, some projects can take longer than others. Q: How do you handle shipping costs? A: If you ship it to us, we will pay for the shipping back. Q: What can you convert my tapes/film to? A: We can convert to any format, but besides DVDs, we typically we use .MP4. Q: How many DVDs will I need? A: DVDs hold about two hours of footage without loss. After using two DVDs on a tape (4 hours of footage), we charge $5 for additional DVDs. Q: Can you convert tapes from overseas? A: Yes! We convert tapes from all over the world. We can transfer PAL and SECAM format tapes for VHS, 8mm, and MiniDV. We can also perform standards conversions (eg, PAL to NTSC). A: We typically send a PayPal invoice you can pay with any credit or debit card. We also accept checks and cash. Q: What if my tape isn’t full? A: We charge by the tape since we clean the entire tape before transfer, and play through the tape from beginning to end to ensure we transfer everything. Q: What if I have a large order? A: Contact us directly! We would love to give you a great deal!